cxfuse.dll that is linked with FUSE application provides necessary implementation for interfacing with the FUSE kernel module. In both cases, file system requests from the kernel are passed to the main program using callbacks. When using the high-level API, the callbacks may work with file names and paths instead of inodes, and processing of a request finishes when the callback function returns. When using the low-level API, the callbacks must work with inodes and responses must be sent explicitly using a separate set of API functions. sshfs is a popular FUSE file system client that allows secure seamless access to remote files with standard SSH account login, as if they were local files. 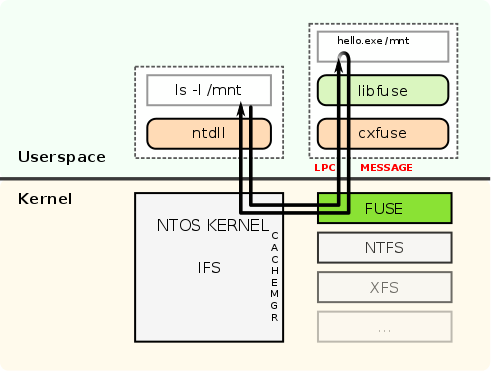 A flow-chart diagram showing how FUSE works: Request from userspace to list files (ls -l /mnt) gets redirected by the Kernel through NTIFS to FUSE. FUSE then contacts the registered handler program (./hello) and passes file systems requests as LPC messages. The handler program returns a response back to FUSE as LPC reply which is then redirected to the userspace program that originally made the request. The high-level API that is primarily specified in fuse.h. Checkout our github project repository in cxfuse and start building your next great user mode file system. Obtain the latest Crossmeta FUSE system installer package that includes EV code signed FUSE driver modules for all Windows releases. The installer also contains the runtime Crossmeta system with additional FUSE programs sshfs and fuse-nfs. Once the Crossmeta setup program finishes successfully the Crossmeta files will be available in the V: drive. There is no need to reboot the system. How to mount UFS2 on Windows?